My Charlotte Tilbury giveaway ends tomorrow! You can also enter to win $50 in a previous post. Dresses and ankle boots are one of my favourite outfit combinations, although I've rarely worn it recently as I've been preferring separates for breastfeeding. I do have a few dresses with buttons I can still breastfeed in so it was good to change things up a little and wear one of my favourite outfit formulas. This was one of those outfits I loved. I really like all the pieces on their own and they work perfectly together. It's basically the summer version of this winter outfit, just without the tights and different accessories. 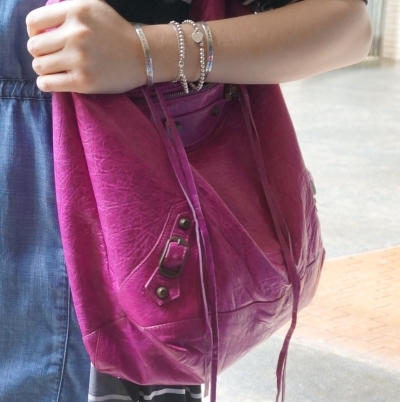 I like wearing this magenta Balenciaga day bag with blue and wear it like that often. Just a quiet day, popped out to get groceries during a break in the rain as it was really stormy. Made the mistake of assuming that we would have time between storms and rain to run errands, get groceries and get home again. Used the umbrella for toddler T and the raincover for baby boy in the stroller which left me unfortunately getting absolutely soaked! A denim dress is not ideal to wear in a downpour so I quickly changed into warm dry clothes when we got home. It's a shame I didn't get to wear this for too long given how much I liked it. Last worn: striped duster, chambray dress, black ankle books, magenta Balenciaga day bag. Other ways to wear: striped duster and monochrome outfit, chambray dress and a baby bump, black ankle boots and printed jeans, magenta Balenciaga day bag and a graphic tee. Win your choice of Charlotte Tilbury makeup! Big contrast to the day above, this was hot and sunny. I actually regretted the choice of ankle boots in the heat of the day! Now it's summer the boots will be packed away. Another simple outfit for a simple day. Took baby boy for his weekly weigh and spent some time with my family in the afternoon. The pink in the print of the dress made this magenta bag the perfect piece to wear with it, even if the heat made me a little uncomfortable. Last worn: Ray-Ban Wayfarer, printed shirt dress, Chelsea leather ankle boots, Balenciaga Day bag (above). Other ways to wear: printed shirt dress in winter, Chelsea leather ankle boots and chambray, magenta Balenciaga day bag and pencil skirt. Linking up with Shoe and Tell, Let It Shine, Grace & Lace. I love that denim dress with the longer cardi..that may possibly be my fave of them all so far this year. Ha. Oops, we're only 6 days in but I really love it. Ooooh I adore that first outfit on you, Mica!! The dress is stunning, but the magenta Balenciaga, oh wow! I'm not envious at all, ha ha! I'm still searching for the perfect denim dress! This one looks great on you. Ankle booties are ubiquitous, and although I have a couple of pairs, I can't get over the choppiness it can give to one's legs - I like 'em with tights though! Very true! I tend to wear mine more with tights :) Hopefully you find the perfect denim dress soon, I was so glad to get this one! These looks are so cute! I'm especially loving the chambray/stripe combo with that bag. So perfect - you make me wish for warmer weather! I love ankle boots. I think so many get caught up only wearing them with leggings etc., that they forget they also look good with dresses. As you have shown here Mica! It's storming here today also. I love these outfits! The combo of dresses and ankle boots is super great! The second dress you're wearing looks super comfy! Hope you like it when you give it a go! :) I've worn boots and maxis together before although not as often as I do with shorter dresses. I love ankle boots. Love the dress with the boots outfit. What a fun bag! I have been wanting to buy off the Real Real. Have you had a good experience? I've never bought from them but have heard good things! :) I purchased this bag from Reebonz marketplace. love the colour of the bag so much! the prints are gorgeous too!! That chambray dress is so cute and so are the boots! Both of these outfits look comfy and cute! I laughed because I was thinking how cute your necklaces were- they're teething necklaces?! No way! Ha. Happy New Year! Hope your 2017 is off to an amazing start. haha yes they are such nice statement necklaces, people are always surprised to find that they are teething ones too! Tremendous outfit dear friend! The ultimate casual chic! Ohh I love these outfits! I would wear them without thinking twice! The styling of the first one is so on point, and you look like one cool modern mum! :) The second one looks so effortless chic, and I always like that effect for my looks. Dresses and ankle boots are really a killer combo! Ooh that long line cardi is cute!! Perfect with a dress / boots combo. I love that combi too, but I agree, in the heat of an Australian summer day it was probably too much. The clothing limitations were what annoyed me most when breastfeeding. After the long time of pregnancy dressing I wanted to go back to normal clothes. But in the end the wait is aleays worth it, of course. Yep longer sleeves and closed in boots was not a clever combo! Looked good though, ha! I'm missing my normal wardrobe but have lots that works for breastfeeding too so that's helping a little :) Like you said it's worth waiting, won't be forever! Cute outfits! I love that little denim dress, but yes denim and rain just don't go together! You look really great in those cute outfits. I love the denim dress and the color of that bag is fantastic! Yes it's ncie to change things up a little and wear some dresses, I will be happy to be back in my full wardrobe soon!